Play Jungle Queen™ online for free now! 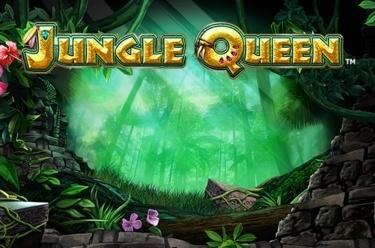 In the slot Jungle Queen™ you'll meet the warrior jungle queen on 5 reels with 20 win lines (40 in the free games). You score the highest Twist winnings with the monkey and the Scatter symbol. 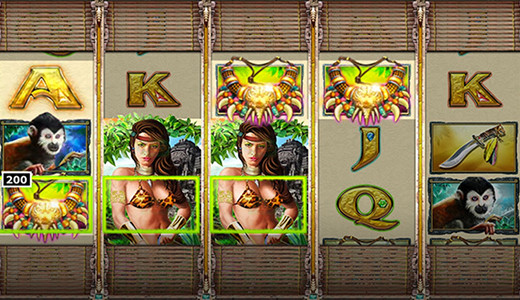 Your aim with Jungle Queen™is to land 5 identical symbols along one of the win lines. All pay lines start on the first reel and end on the fifth reel. The Scatter symbol pays a win when it lands 3, 4 or 5 times in any position on the reels regardless of the pay line course. Five free games are triggered if the jungle queen appears completely on the second, third or fourth reel. Moreover, she can act as a substitute for all other symbols except for Scatter and increase your winning odds. During free games all reels expand from 3 to 5 positions and the number of lines is doubled to 40. Free games are triggered by the jungle queen who appears completely in the regular game, expands to all reel positions and is fixed for the duration of the 5 free games. If the jungle queen appears completely on a reel once more during free games, she expands to all reel positions and is fixed during all subsequent re-spins. In addition, each complete jungle symbol triggers another re-spin! Armed with bow and arrow she demands but one thing from you: respect! Since the fierce empress rules the reels of Jungle Queen™ with her fighting skills it is easy to honour her wishes. If you prove yourself worthy she will take you on a journey through tropical forests and every now and then grant you a free game. Apart from more reel positions free games boast 40 pay lines instead of the usual 20!